My only baby sister [well, my only sibling at all] just graduated college this past month with a Bachelor's degree in Studio Art. She had hinted at us a while back that she did not want any "things" for graduation gifts. So, instead of buying her some token that would sit on her dresser for the next ten years collecting dust, we [meaning my parents, her boyfriend, my boyfriend and myself] decided a nice getaway would be appropriate. After much research and collaboration, plane tickets were bought and hotel rooms booked for a week-long vacation to New Orleans, Louisiana. Originally, my parents were supposed to come along, but scheduling conflicts left my sister, her boyfriend, my boyfriend and myself. None of us have ever been to New Orleans, so we are all very excited. We embark on this fun little trip in July. Yes... We're all very much aware of just how hot it is going to be. Nevertheless, we are all so ready. Brainstorming a way to give the gift to my sister was a fun task. In the end, I ended up at the dollar store sifting through the Mardi Gras section in the party aisle. 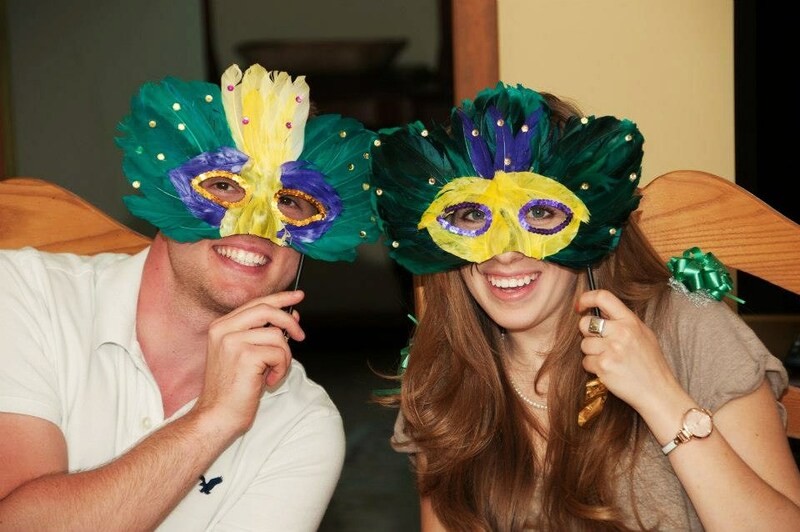 Masks, beaded necklaces, and other Mardi Gras party necessities were wrapped in tissue paper in a gift bag. Her first guess was Venice. Wishful thinking, sis. At the bottom of the bag was a blank, unlabeled map of New Orleans and a blank plane ticket. Eventually, the surprise was revealed. Recently, I have been doing some research on what there is to do in New Orleans. I'm a planner. As much as I enjoy spontaneity, I like to be educated on the place I'm headed and what there is to do there. I recently found a couple great blogs that have prepared me so much in learning about this fun city. Reading these have amped my excitement for this excursion by a million. From what I've learned, New Orleans is a city for the foodie in me, as well as the cultural student in me. Come our return in mid-July, I can't wait to tell you all about our time in New Orleans. I sincerely hope these other blogs inspire you to add this unique place to your bucket list!